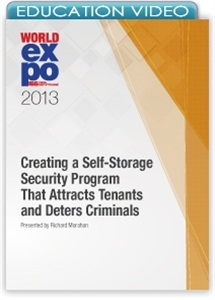 Speaker: Richard Morahan, Marketing Consultant, Lock America International Inc.
Customers may shop for self-storage based on convenience or price, but if they don’t think your facility is safe, they won't rent with you. In this session, our presenter discusses how to develop and market a security program that attracts customers and deters criminals. He walks you through an imaginary facility, outlining the cost and benefits of various security options. He shares case studies of three successful operators who have used a security image to succeed in their very different markets. Finally, he examines ways to prevent all varieties of criminal activity, highlighting the critical role of well-trained staff in the mission.